To all of you who have supported me before, during and since the launching of Woolkeeper.com, I want to thank-you from the bottom of my heart. I’m one fortunate Woolie to know so many kind stitchers & quilters and to have so many dear friends. Woolkeeper has 3 new Pin Keep designs that are perfect for Valentine’s Day or any day. Cute As A Button has polka dot buttons that will make you smile and seed beads for a little glitz. S.W.A.K. is a fun way to learn or practice the colonial knot. Simply Sweet is simple in design, easy to make and sweet when it’s completed. Every pin keep kit will include three free decorative pins. I used wool and gorgeous hand dyed velvets from Blackberry Primitives for these keeps. I love their velvet and know you will like creating with it. Can a girl have too many sewing keeps? Not me, so there’s a new one. Sweethearts is all wool and has room for scissors, thread, needles and pins. It includes a free decorative dragonfly pin for the cover. Last offering is an 8” x 15” all wool mat. I love this size because it fits in so many places. With all My Heart features delicate hearts and forget-me-knots on a very soft herringbone background. 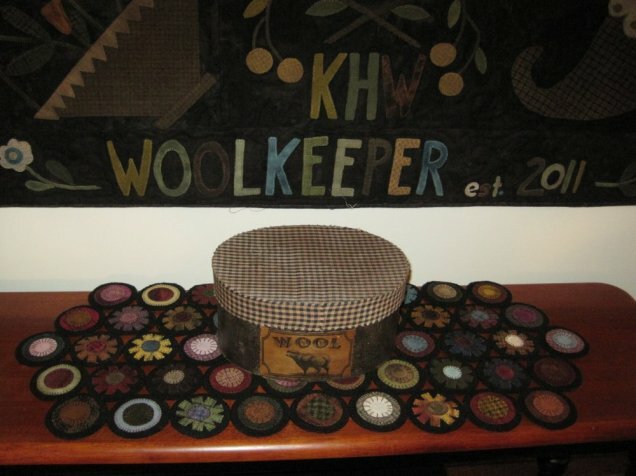 Woolkeeper has a phone number- 331-207-2855. Please Email or phone with any requests or questions. The Woolkeeper Blog is coming soon. Wishing you the comfort and joy of wool, needle and thread.